CHARLOTTE, NC (WBTV) - Rosters for the NBA All-Star Celebrity game have finally been announced ahead of the festivities in Charlotte next weekend. A couple names jump off the page on the home team. Chris Daughtry, Doctor Oz, Jay Williams and A’Ja Wilson all have star-power to add to the Friday night event at Bojangles Coliseum. A’Ja Wilson, the 2018 WNBA Rookie of the Year, played an hour down the road from Charlotte as a member of the women’s basketball team at South Carolina. Wilson was awarded the NCAA Tournament’s Most Outstanding Player award the year the Gamecocks won their first NCAA Women’s Basketball Championship in 2017. Dawn Staley, who was selected with the ninth overall pick in the 1999 WNBA Draft by the Charlotte Sting, returns to the Queen City as the head coach for the home team. Two years after being drafted by the Sting, she led the team to a Championship game birth in the WNBA playoffs. Staley is a three-time Olympic gold medalist who also coached the South Carolina Gamecocks to four SEC regular season championships, four SEC tournament championships, six Sweet Sixteens, two Final Fours, and the NCAA Women’s Basketball Championship in 2017. Quavo, Ray Allen and Bad Bunny headline the Away roster. Coach Sue Bird was the first overall pick of the 2002 WNBA Draft. She has been selected to eleven WNBA All-Star teams and eight All-WNBA teams. She is also a four-time Olympian. 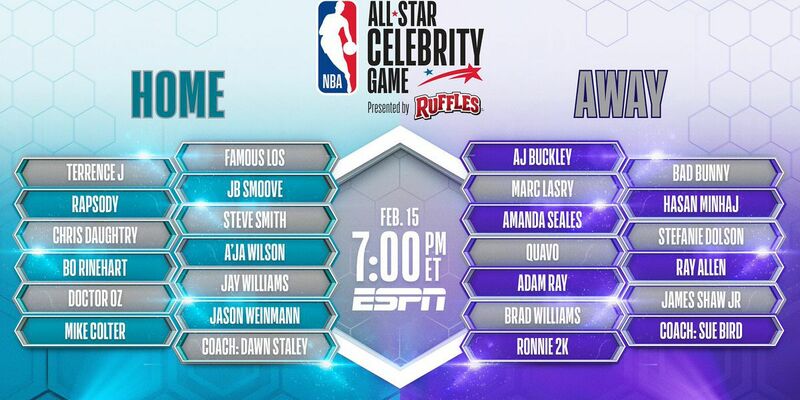 The 2019 All-Star Celebrity Game presented by Ruffles will tip off at 7 p.m. at Bojangles Coliseum on February 15.